In the fast paced emergency environment, the TE7 responds with its fast boot-up time, intuitive user interface, and ED specific applications, such as EM ABD, EM FAST and Q-path. Extreme portability, extended battery life, wireless communications, and ergonomic profile make the TE7 an ideal partner during emergent situations. 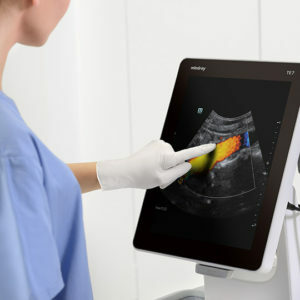 The TE7 supports rapid cardiac and abdominal evaluation at the bedside for critically ill patients. 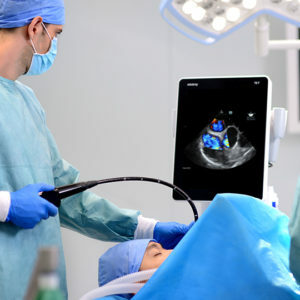 With its rich application suite, including cardiac capabilities with TEE support, and biopsy guidance tools, the TE7 is an excellent choice for intensive care environments. 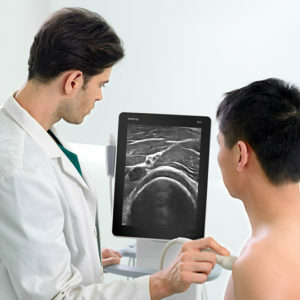 With its compact touchscreen and advanced features, including iNeedle™ visualization and dedicated nerve exam presets, the TE7 is an ideal system for nerve block and pain management. With the addition of cardiac functionality and the TEE transducer, the TE7 also meets the demands of the high end CVOR environment.